It's officially Christmas time in Rob Kardashianand Blac Chyna's household! 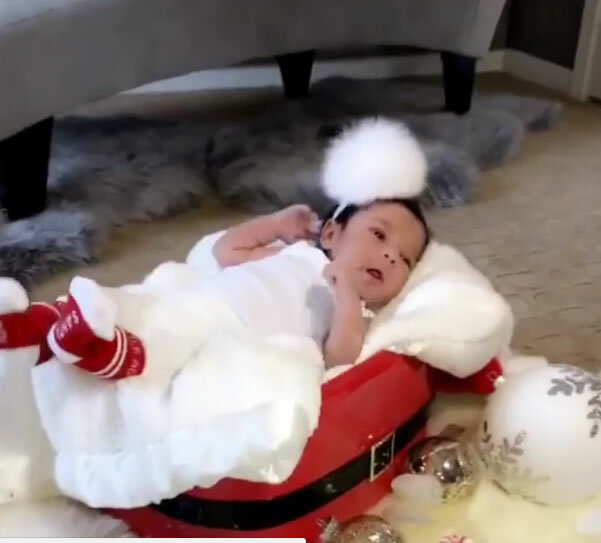 The proud dad shared the sweetest video Friday on Instagram of his baby girl, Dream Kardashian, getting right into the holiday spirit while modeling for Rob's Arthur George sock line. Dressed in a pair of red and white "Santa Baby" socks and festive fur headband as she wiggles around a set of fake snow, candy canes and ornaments, the two-week old looks more than ready to open her presents come Christmas day. Grandma Kris Jenner posted Dream's holiday moment on her own Instagram page, calling the littlest Kardashian "our precious angel." She's almost too cute to handle!